We hope everyone is having a great start to 2019! In Ohio, we have been in the midst of the bitter cold spell that is gripping much of the nation. Of course, being Ohio, it is supposed to be in the fifties next week! A good place to learn about being adaptable! We are getting a bit of a late start with new things for the year. We spent January getting things streamlined and setting new goals and now we are ready to share what is new with all of you! Below are brief descriptions and links to learn more. New Client Referrals – We love word of mouth referrals! As a thank you for helping people connect with us, the person you refer can take 10% off their first spiritual coaching session and you can take 10% off your next session too! Workshops – We offer a lot of different types of workshops (and will be adding more)! We will continue to offer workshops monthly and now you can also have us do a workshop with your friends, colleagues or loved ones. Workshops can be held at our location or we can come to you. Plus, with a minimum of four paid participants, the organizer gets to come free! Private Events – Spirit Earth Coach Nancy Nicholas offers Empowerment Circles for private events which provide a mini reading for each participant with the intention that all readings hold gifts for everyone listening. Circles can be done on a theme or with a more general focus. She is also available to do mini reading private sessions at your event too! Coaching Packages – For those interested in ongoing coaching, we are now offering coaching packages which offer discounts from 10-30% off. There is also a mentoring package add-on option for those who want a more focused plan and additional email support throughout the 30 day period. Retreats – This option offers half day, full day or overnight spiritual coaching retreats for an individual (or you can come with a friend). Winter retreats will be held at our winter home on ten beautiful acres in Northeast Ohio. 2/2 OR 2/6 Abundance Workshop (Hinckley, OH) – This workshop had to be rescheduled because of the crazy cold and because of scheduling conflicts we have decided to offer it twice. See below for details! What to Expect – We will be teaching a card game called Hand and Foot and using it to teach concepts on how to manifest the abundance you are seeking. Through this fun game, you will discover just how powerful vibration is to what you experience and learn techniques to work with gratitude and your Angels to have magical results! Intuitive insight into how you can apply what you learn to your own abundance goals will also be shared. We will also be providing a light lunch (Saturday) or light dinner (Wednesday) of soup, homemade bread and a sweet treat! *We still have a few spots open, so use the contact form below (or reply to your email for those who are email subscribers). Interested in our weekly newsletter by email? We send out a weekly newsletter to our former and current clients (or those referred by clients) every week. Let us know if you’d like to be added by using the contact form below or replying by email! Wishing you all an abundant and joyful February! We hope everyone is having a good start to 2019! We wanted to share about an upcoming workshop in Ohio coming up this month. We also have an option for those who aren’t in the area to receive a personalized recorded reading. Read on to learn more! How to Register: Use the contact form below to register for this event. For those receiving this to your email, you can just reply to the email to register as the contact form is only available on the website. For those unable to attend the event, we also offer a 15-20 minute personal intuitive reading that is recorded for you to listen at your convenience (you will be sent a link to download the recording or to listen in your browser). The reading will explore a healing focus for you, intuitive guidance from your Spiritual Support Team of Angels and Spirit Guides, and techniques and tools you can use to support your healing throughout the month. How To Register: Use the contact form below and indicate that you are seeking a recorded reading. For those who are email subscribers, you can reply to this email as the contact form won’t show up for you. We offer a weekly newsletter with inspirational tips, a weekly oracle card reading and news of upcoming events and opportunities to connect for our past or current coaching clients. If you have had a session with us or attended an event in the past, we are happy to have you on our email list! Just use the contact form below (or reply to the email for those receiving an email subscription) and we will get you added. Sending much love to all! Spirit Earth Coaching LLC will be having a booth for this wonderful event in North Olmsted, OH. See below for the details. We hope to see you there! What to Expect – There will be many different vendors at this event offering a variety of services and products to sample – all connected to empowering greater health and well-being. Visit Our Booth – Profits from this event will go toward the Coaching Fund to help us continue offering discounted services to those in financial need through our Coaching Club Membership and other discounted or free offerings. Animal or Plant Totem Readings: Come visit us and be connected with an Animal or Plant Spirit Guide! You will learn more about the Animal or Plant Totem that comes forth and also receive an intuitive message to empower you. Energy Essence with Personalized Blend: We will be offering Energy Essence Readings where we will discover the best energy essences (these have been gathered from around the country and connect you with the powerful energy centers of Mother Earth). We will discuss the significance of the essences that come through for you and also give you a personalized blend to take home. Mini Medicine Wheel Readings: The Medicine Wheel has been used in many cultures to empower deep transformation. For this reading, you will receive insight into where you are on the wheel at this time. The reading will connect you with element, archangel, and provide a specific message to support you on your spiritual journey. I am so happy to share that I have made the name change to Spirit Earth Coaching LLC! 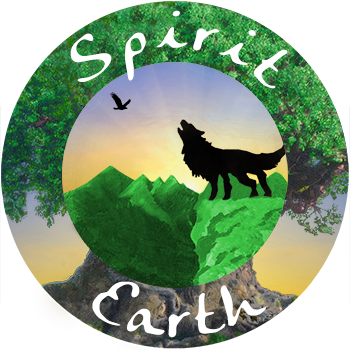 As those of you who have been with me for awhile know, Spirit Earth was the name of my second business that I had started in Colorado. For several reasons, we ended up deciding to dissolve it back in January. I was very sad to let go of the name and the concept of Spirit Earth, as it is such a good representation of the type of work I do now. Recently, I learned that I could just change my business name, so I have decided to do that! For those of you who didn’t realize my business name was Crossroads Coaching (you probably think it is Empowering LIghtworkers), that is one of the reasons it feels safe to make this shift! I started Crossroads Coaching when I was at a “Crossroads” in my life – moving from a career as an elementary teacher into doing my life’s calling as a life coach. Now, I am on a quest to live a spiritual life that is centered around living close to the Earth – thus Spirit Earth Coaching LLC is a much better fit! Empowerment Readings NOW Spiritual Life Coaching Sessions: I will still be offering the same type of sessions I’ve been doing in the past under the header of Empowerment Readings. I’ve changed the name because I feel it is a better representation of the full extent of what those sessions are about, since they combine intuitive guidance with teaching and coaching. Also, this will allow other types of spiritual coaching sessions to be offered as we go along. Earth Living Skils: Spirit Earth Coach, Ryan O’Toole, and I will be offering more Earth Living Skills in the future. These skills combine spiritual tools with nature-focused activities. More on that soon! Website Blog: We are going to share more about our travels on the website blog then we have been doing this last year. If you want to follow, there is a place to sign up on the website. See below to go to the website home page. The option fo follow the blog (you can do this via email) is on the right side. Workshops/Classes On the Road: We are going to be adding a page with types of workshops and classes we offer that will be available in Ohio or in other areas by request. More on that soon! What to Expect: We will be gathering around a fire to listen to the gentle wisdom and humorous teachings shared by Elder and Spiritual Teacher Ray Reitze for this three-hour Wisdom Circle. Participants will learn about Ray’s exceptional life, what he has learned along the way, and about the gifts of living a simple, connected life in harmony with Nature. Ray will also be sharing simple meditation techniques to help you get more deeply connected to your self and to the natural and spiritual world around you. The event will begin with a brief introduction and then Ray will be sharing about his life and experiences. Participants will also have ample opportunities to ask questions. We will take a break midway through for refreshments and a chance to connect more informally with those who gather for the event. The second hour will provide opportunities to practice different meditation techniques, to ask questions, and explore more deeply what Ray has shared. Ray has lived a rich life with many adventures along the way! He was mentored by a Micmac Native American elder as a child, went through the Vietnam War, owns and runs a Maine Canoe Guide business, and mentors and teaches those seeking to live in a simple, connected life in harmony with one’s spirit and nature. He lives in a beautiful yurt-like log home off grid in the Maine woods and has much to offer the world on how to step away from life’s dramas and get back into a no-nonsense way of living that is deeply connected and joyful. I hope you are having a wonderful Sunday! I wanted to pass on the information about this Fundraising event that offers empowering services and helps horses in need (and programs to help veterans too!)! Forever Amber Acres Animal Sanctuary is a horse sanctuary In Medina, OH. I’ve included the flyer and a link to their website. Even if you can’t make it to the event, you might want to consider making a donation to this very worthy cause! May Fundraiser – Second Drawing Coming Soon! Thank you so much to those who have contributed to the May Fundraiser! It is so appreciated! Congratulations to Linda, Teresa and Tom who won the first three prizes. The next drawing will be at the Women’s Wisdom Book Club meeting on 5/21. You can make a love offering to the Coaching Club Fund to support this Fundraiser and get a chance to win three great prizes (see below for details). I will also send anyone who makes any contribution to the Fund a meditation recording ($10 value) that will help you to set up your energy system optimally to have a GREAT DAY! Healing Meditation Bundle (Crossroads Coaching) – $30 value: This kit provides two energetic essences to help bring healing, a Palo Santo smudging stick to clear your energy field, a small candle and two small crystals to support the process. Directions are also included on how to best use it. 30 Minute Reiki Session with Neil Kopchak $35 value – Neil is a Reiki Master with 10 years experience. He has additional training and experience helping to ease depression, anxiety and PTSD through meditation and Reiki healing. Sessions are available in Hinckley, OH. For every ten dollars you contribute, your name will be entered into the drawing. So for example, if you contributed $100, you would be entered ten times and your name will stay in the drawing through the end of the month. Use the Coaching Fund link below to make a love offering (or use the contact form at the end of this post if you would rather make a check love offering instead of using PayPal). To make a love offering by check, please use the contact form below and I will be in touch with information on where to send it! Thank you for your support! I have been blessed to work with some amazing people over the years and this year is no exception. I have an amazing group of women that I would love to gift with a $100 scholarship to attend a spiritual retreat with me in Asheville, NC. I have already given them 50% off on the retreat cost, but would like to provide some additional support, as they have all gone through some significant family and financial challenges. Below is a little bit of their stories and ways you can help me reach this goal, as well as information about gifts for you too! I wanted to share a little bit about the people who will benefit from this Fundraiser. Thank you for helping me help them! Candidate One – This kind soul is the mother of a beautiful little boy. He was born with Down syndrome and other physical challenges that will require special care for his lifetime. His mother has been the principal caregiver for the seven years of his life and she is the most loving, wonderful mother! Along with caring for her son (including having to purée all his food, attempt to communicate with him as he is non-verbal, and meet his other needs), she has also had a chronic illness herself. She has had many other challenges along the way, but instead of giving up, she continues to push herself to learn and grow into her highest potential. She is a very gifted intuitive and has great personal insight. I am very happy to be able to coach her and help her move into her empowerment! Candidate Two – Have you ever met anyone who always makes everyone feel at home? This candidate is like that. She is so genuinely kind and friendly that she is the heart of whatever group she is in. She always is willing to help and encourage and often takes care of everyone instead of taking care of herself. She has raised a beautiful daughter with Asperger’s Syndrome on her own and also cared for her mother, both of which still live with her. This last year has brought a lot of financial challenges with unexpected expenses because of medical challenges, cars breaking down, and debt from college. Despite all that is on her plate, she continues to focus on how she can grow spiritually, help others, and learn how to unconditionally love and support herself. I am incredibly grateful our paths have crossed and feel very honored to be able to help her continue growing her immense spiritual and personal gifts. Candidate Three – I have great love and respect for this candidate! She has gone through many trials in her life, including going through breast cancer a year ago. She has spent her career learning about how to help others through studying nursing, nutrition, acupuncture, and social work. Going through cancer and chemotherapy deepened her commitment to a path of spiritual growth, deep inner reflection, and a desire to be of service to others. She has great self-awareness and I feel very lucky to have been a part of her journey! I would love to help her continue growing and healing through a scholarship for this retreat. Coaching Fund Love Offering – Visit the Coaching Fund page at the link below and your name will be entered into the drawing for every $10 love offering. For example, if you made a $100 love offering, you would be entered 10 times into the raffle. We will be pulling names for prizes on 5/11 (New Moon Circle), 5/21 (Women’s Wisdom Book Club) and 5/30 (Spiritual Retreat) and you will be notified if you win. Your name will stay in the drawing for the entire month, so the earlier you make a love offering, the more chances you will have to win! The goal is to provide $100 Scholarships to each of the candidates. Any additional funds raised will be used to meet the goals of the Coaching Fund to provide affordable, ongoing coaching support for those who need it through scholarships, discounted events, and discounted coaching sessions. Below are a list of the prizes you could win when you make a love offering for the Fundraiser. Your name will be entered for every $10 love offering you submit. Prizes can be used by the winner or gifted to someone else. Your name will remain in the drawings until you win, so if you make a love offering early in the month you will have three chances to win something. Thank you for sharing this with anyone you think might be interested in helping out and participating in the raffle! Also, let me know if you would like to offer a session or product for a future fundraiser with the continued goal of making these types of services available for anyone who needs them! Those who offer services are also entered into the raffle. If you have questions or would like to make a love offering to be entered into the raffle but would prefer to contribute by check or cash, please use the contact form below (or for email subscribers – just reply to the email). Sending love and gratitude to all! It is always a joy to see the natural world coming to life in the spring! We have been busy setting up our new Tentipi in Hinckley and are excited to share this new space with all of you! See below for an inspirational recording offering some intuitive input for the month of May and also news about upcoming events this month. *These sessions can be scheduled by phone or in person (in the Tentipi! In Hinckley, OH). Personalized Energetic Essence Session and Product: I have been working with energetic essences for myself and loved ones a lot lately and they are a very powerful tool! I thought it might be helpful to offer this in combination with an empowerment reading, so that you can have a tool to use on your own following the session. I have a collection of energetic essences I have gathered from our travels that will be used for this session. Each essence is linked to an energy center of the earth bringing powerful healing to the whole system. The earth has all the same energy centers we have in our body and I also have energetic essences for working with animals, plants, Angels, and other spiritual beings. For this session, I will see what energetic essences are needed for you and we will get guidance on why it is needed and how it can best support you in making changes. You will also get a bottle of the essence that you can add to water or use in a bath at home. Love Exchange: Session and Essence: $65/Members or $130/Non-Members. Personalized Essence Only (I will prepare and send you the essence): $35 – Includes domestic shipping and taxes. International customers may have an additional fee depending on shipping costs. North Carolina Spiritual Retreat 5/25-5/28 – This event is full, but watch for news coming out soon about a fundraiser that will have great prizes you can win and a free guided mediation to help you set up your energy system for a GREAT DAY! Spring is a time of new growth and with all new birth, the process can sometimes be painful or scary. If you think about a seed’s process before it pushes through the soil, there is a time when it may have no idea what it is reaching for. There is even the possibility that it won’t break through the shell that protects it to start growing at all. I feel we are collectively in such a period. We often resist letting go of our “shell” because we are afraid we will be hurt if we don’t stay hidden in the place we have felt protected. But just like the plant, if we don’t answer the call to grow into our full potential and to create new life, we will eventually stagnate and die. When we “look deeper” into the circumstances of our lives, we discover there is no reason to be afraid. In fact, we, like the plant, are wired to survive and thrive. The plant is instinctively drawn toward the sun, even if it is unable to see it. We, too, are wired with a deep wisdom and powerful life force that wants us to thrive and grow. That is the key this month for working with the energies of this card. It is to surrender to a deep trust that there is a part of you that always knows what is needed. It is the part of you that is connected to the Creator and the Earth itself. It knows where the light is and it knows what it needs to draw from the soil to grow toward that light. As we look beneath the surface of what is happening within us and our world, you can see that there is a seed that has broken open and new life that is pushing to be born into our world. Have faith that it will happen. Relax and trust that no matter how many times you look and see an empty field where you planted your dreams, that in truth, many of those seeds are on their way up to the surface ready to burst into life. This is a wonderful video sharing a 10 minute morning yoga chakra balancing sequence which originated with Anodea Judith (one of my favorite spiritual teachers/authors!). This is a gentle, easy practice that anyone can do and it will help get your energies flowing at the start of your day! To register for an event or session, you can use the contact form below. If you are an email subscriber, you can just simply reply to the email. Thanks! Wishing you an abundant and joyful month!